Assuming that I don’t sell anything in October either, I’ve got plenty of tote bags to use as Christmas gifts. 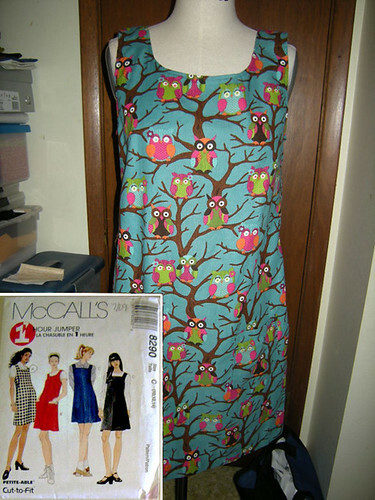 Also on a happy note, Now I’ve got lots of time to get to sewing clothes. Then Christmas gifts for the kids. And then it will be knitting/crocheting season! So, I did get a chance to make this dress a few weeks ago. It doesn’t look as cute on the manni, but it’s pretty cute on the pattern. I can’t wait for it to cool off just a little so I can finally wear this and pair it with brown tights and gray boots. The pattern included some flowery brooch thing, but I just added my own leaf pins, which I think compliment fall very nicely. The pattern was pretty easy. The pleats took the longest. 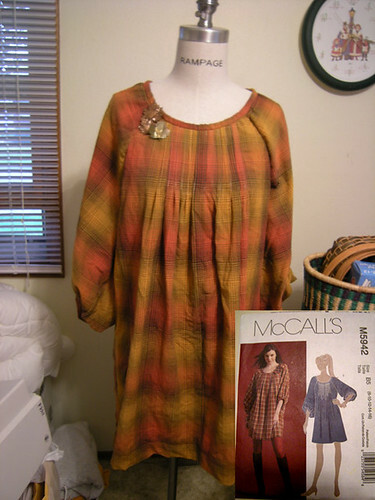 What you can’t see in the photo is the back, there is a round bottom panel that connects the back body, sleeves, and collar. It contains two of them actually, to hide a bunch of seams. One of the panels called for slits on each side of the panel to a certain circle, but it didn’t make any sense when I actually sewed it, the slits were on the outside of the dress and visible. So, 75% done and I decided to take that whole panel out and switch it with the one without cuts. There was one other pattern issue with the main back panel and how it connected to the sleeves, but I worked around it. The fabric is from Walmart. I feel odd purchasing fabric at Walmart, but it was exactly what I was looking for and only like $2 or $3 a yard! What’s a girl to do in that situation?! Anyways, I promise not to make a habit of it, I still buy my supplies mainly from the fabric stores. I ❤ this next one! Whew! I have been sewing up a storm, getting ready for Market Day. If you’re in Des Moines this coming weekend, you will definitely want to check it out. Learn about Market Day and RSVP to Market Day on Facebook. 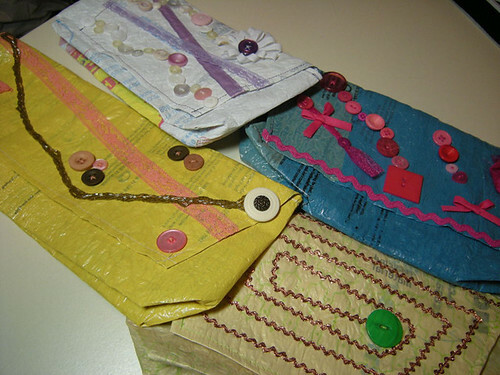 I will be selling little makeup bags for your purse, recycled clutches and recycled tote bags! Today, my favorites are the clutches, because there are so many fun embellishments involved – I’ve had a blast collecting trims, buttons and charms. I could spend all day describing the products for sale, but I’ll let them do the talking. Click on any of the photos to see the Flickr set (includes more photos!). 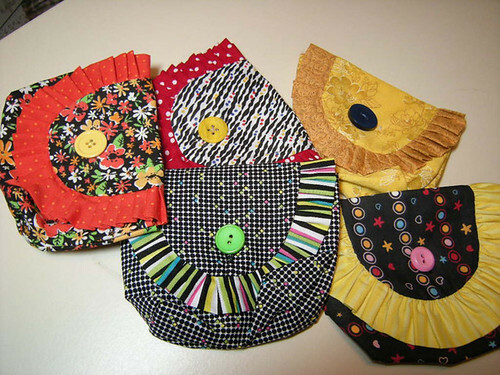 Makeup Bags - all cotton with button closures. These are the clutches - the yellow one is my ABSOLUTE favorite, and I secretly hope no one buys it so I can carry it around. 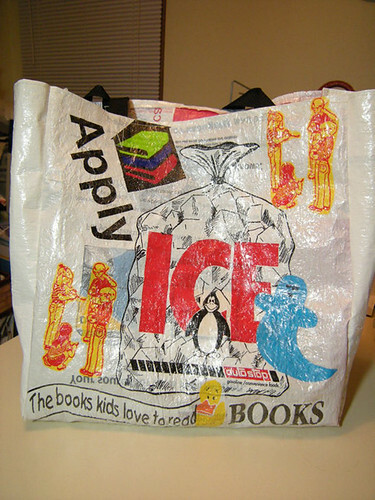 This one is called "Ice Ice Books" Click on the image for more photos!